Gouty Arthritis is caused by a defect in the ability of the body to cleanse an over-abundance of uric acid from the system. The excess uric acid crystals then settle in the collagen tissue throughout portions of the body. 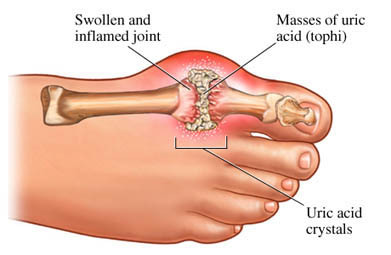 The uric acid crystals are commonly found near the joints. They are also found where poorly dissolved uric acid can easily fall out of solution, near cooler portions of the body. Out of one million people diagnosed with gout or gouty arthritis, 95 percent are men. The signs and symptoms of gout arise between the ages of 40 and 60. Common symptoms of gout are inflammation of the big toe, instep, ankle, knee, wrist and elbow joints, causing excruciating pain. Sharp needle-like stabbing pain occurs upon the movement of joints. The skin around the affected area is usually hot, shiny and dusky red or purplish. Reactions can include fever, heart rate increase and chills. The severe joint pain can occur sporadically and last for days. Yet, in some cases, the attacks can last for months. Without treatment, joint deformation and limitation of movement can occur. If you continue to suffer with gout or gouty arthritis and your current treatment plan leaves you feeling hopeless, perhaps a fresh set of experienced eyes can change your outlook. Since 1990, Dennis M. Lox, M.D has applied his personal interests in sports medicine, cutting-edge regenerative medicine and chronic pain management to helping patients increase their quality of life. Contact us for an appointment at 727-462-5582.